Interlaken is a paradise for adventure lovers, from hiking, biking, paragliding, skiing there is a lot one can do. We had planned an early morning trek up to Harder Klum, followed by a lazy afternoon exploring the castles of Schloss Thun. However the rains had other plans for us. 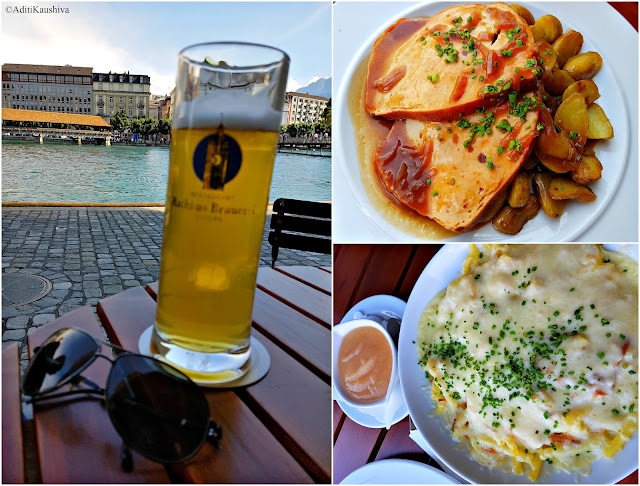 We waited till about noon for the skies to clear but no such luck, and although a bit disappointed we decided to continue our trip to the charismatic and charming city of Lucerne. Tip 3: You cannot plan your trip around the weather! Many travel websites advice to check the weather update in the morning (especially when one is going to Jungfrau) but when you are travelling for a set period of time you need to learn to make the best of your time and enjoy the weather in all its quirkiness. Lucerne is picture perfect at every corner. While the pristine lake dotted with white swans and engulfed with majestic mountains takes your breath away, the quaint city with its cobbled old squares and rich history keeps you intrigued. After a breezy and beautiful train ride we reached Lucerne by late afternoon and headed to explore the city. Sitting across the river Reuss, the Kapellbrucke - Lucerne's romantic wooden bridge in the backdrop, we found ourselves enjoying a great meal at Rathaus Brauerei. And then we walked down the bridge admiring the 17th century paintings which decorate the interiors of this very iconic landmark. This Chapel bridge is one of the oldest wooden bridges in Europe (originally built in 1333) and commands all the attention from tourists in the city. And why not? It is pretty from any side of the town. As we walked down, we saw the beautiful Baroque styled church on the left bank of the Reuss. The Jesuit Church is a testimony to the fact that Lucerne was the only major Swiss city to stay with the traditional catholic beliefs after the Swiss Reformation. The church now holds concerts and organ recitals inside and is a good place to relax and seek a perspective on the city and life. As we entered the cobblestoned streets of altstadt (old town) we found ourselves in a time capsule, the charming squares, frescoed buildings and iron wrought signs atop shops were so well preserved. We strolled leisurely, making our way to the top of the clock tower and then to the beautiful monument of the 'mourning Lion'. The clock tower (Zytturm) is one of the nine towers of the Museggmauer (city walls) and houses the oldest city clock, built by Hans Luter in 1535. The clock chimes every hour, one minute before every other clock in the city. Cool, huh? Hike up to the towers is well worth the time as it offers one of the best panoramic views of the city. The first thing that struck me as about the Lowendenkmal (The Lion Monument of Lucerne) is serenity of the space and the magnanimity of the monument. Sitting amidst the shade of green trees the dying lion commemorates the Swiss mercenaries who, in the service of Louis XVI King of France, were massacred in 1792 during the battle of Tuileriess, and this is one of the most soulful monuments I have seen. Just a few hours of exploring this city made me fall in love with it, and I couldn't wait for tomorrow to wake up to another day in nature's paradise. So lovely Aditi! You are right about the weather and traveling, one must learn to enjoy a place in all its quirkiness! Lucerne sounds so wonderful and seen through your lens so rich in history. The Lion monument is something I would love to see. Thanks for sharing some beautiful pieces of your travel. Awesome pictures and the place is so beautiful. I agree that tourists can't think much of the weather. Just head out and enjoy to make the most of what's out there. The Lion monument has a calming effect and those clouds tell how much peace the place has got. Have fun and keep sharing. Beautiful. The architecture, the ambience and the commentary are all fab, Aditi. That last sculpture made me cry the first time I saw it. Thank you! 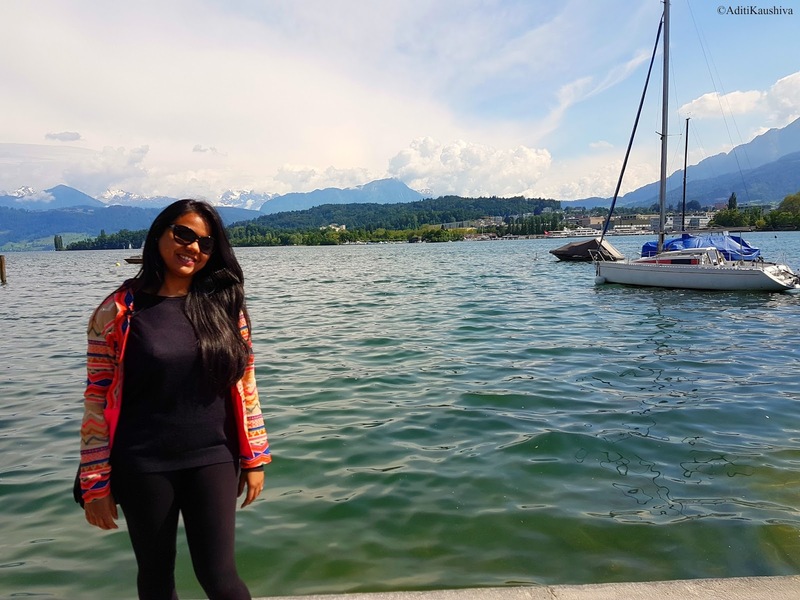 Switzerland sure is heaven on earth and you've seem to explore it just perfect! The pictures have come out so pretty Aditi! Switzerland is there on my wish-list.. Let's see when it gets fulfilled! Oh those were the days when I had travelled to all these places and more. It's been 13 years but the places are still quite vivid in my memory and your pictures actually brought back those memories of the years gone by. Lovely pics and the write up :). Lovely but when will you tell us about the cheese fondue and chocolates?